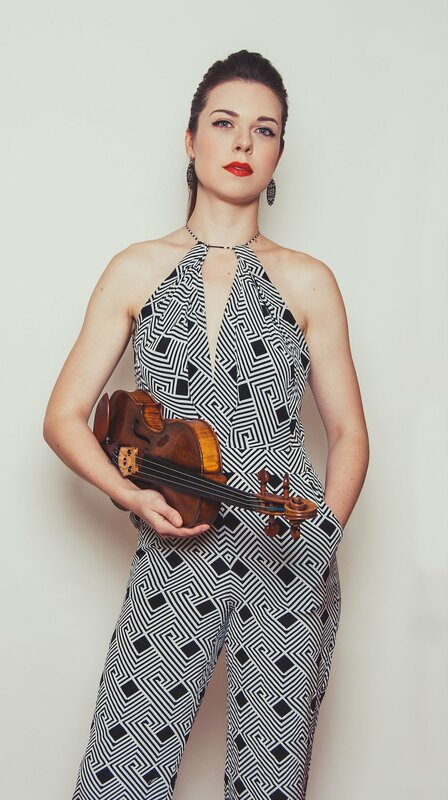 Recipient of a 2016 Avery Fisher Career Grant, Silver Medalist in the 9th Quadrennial International Violin Competition of Indianapolis, and winner of the 2012 Naumburg International Violin Competition, Tessa Lark is one of the most captivating artistic voices of her time. She is praised consistently by critics and audiences alike for her astounding range of sounds, technical agility, captivating interpretations, and multi- genre programming and performance. Also the recipient of a career grant from the Leonore Annenberg Fellowship Fund for the Performing and Visual Arts in 2014, Lark continues to expand her relationships with orchestras and presenters on stages worldwide. She has appeared with orchestras throughout the U.S. since making her concerto debut with the Cincinnati Symphony Orchestra at age sixteen. As part of Carnegie Hall’s “Distinctive Debuts” series she performed in February 2017 at Carnegie’s Weill Recital Hall. Lark has also been presented by the Isabella Stewart Gardner Museum in Boston, the Perlman Music Program, San Francisco Performances, Dame Myra Hess Memorial Concerts, Ravinia’s Bennett-Gordon Classics series, the Troy Chromatics series, Chamber Music Tulsa, the Caramoor Wednesday Morning Concert Series, Seattle Chamber Music Society, and the Marlboro, Yellow Barn, Olympic, and Music@Menlo festivals. Highlights of her 2016-17 season include a recital with pianist Peter Klimo at Tivoli Vredenburg in Utrecht and U.S. concerto engagements with the Alabama, Richardson, Valdosta, and South Florida symphonies; the Evansville and Lexington philharmonics; the Gettysburg and Mission chamber orchestras; and the Symphony of Westchester. Lark has been soloist with the Cincinnati, New Haven, Hawaii, Santa Fe, Indianapolis, Cheyenne, Santa Cruz, and Peninsula symphony orchestras; the Louisville Orchestra; CityMusic Cleveland; the New Juilliard Ensemble Chamber Orchestras; and internationally with the Chinese Opera and Ballet Symphony. A passionate chamber musician, she has toured with musicians from Ravinia’s Steans Music Institute and will appear on two tours with Musicians from Marlboro in 2018. Her piano trio, Trio Modêtre, took top prize in the 2012 Fischoff National Chamber Music Competition. Lark has collaborated with a growing list of renowned artists including Mitsuko Uchida, Itzhak Perlman, Miriam Fried, Donald Weilerstein, Pamela Frank, Kim Kashkashian, Peter Wiley, and Ralph Kirshbaum. She joined Caramoor Virtuosi as a result of her participation in Caramoor's Rising Stars Series. Keeping in touch with her Kentucky roots, Lark performs and programs bluegrass and Appalachian music regularly. She collaborated with Mark O'Connor on his CD "MOC4," released in June 2014. She also plays jazz violin, most recently performing with the Juilliard Jazz Ensemble at Dizzy’s Club Coca Cola in New York City. She premiered her own Appalachian Fantasy as part of her Distinctive Debuts recital at Carnegie Hall, where she also gave the world premiere of Michael Torke’s Spoon Bread, written specifically for her stylistic capabilities. In addition to her busy performance schedule, Lark has served on the faculty of the Great Wall International Music Academy in Beijing; and, as a From the T op alumna, is active in their arts leadership program as a performer and educator. Lark’s primary mentors include Cathy McGlasson, Kurt Sassmannshaus, Miriam Fried, and Lucy Chapman. She is a graduate of New England Conservatory and currently holds a Jerome L. Greene Fellowship and the Ryoichi Sasakawa Young Leaders Fellowship in Juilliard’s Artist Diploma program, studying with Sylvia Rosenberg, Ida Kavafian, and Daniel Phillips. Lark plays the 1683 “ex- Gingold” Stradivari violin on generous loan from the Josef Gingold Fund for the International Violin Competition of Indianapolis.